Built to contract 12829 her first flight was from Belfast on 08 October 1959 and delivered to No. 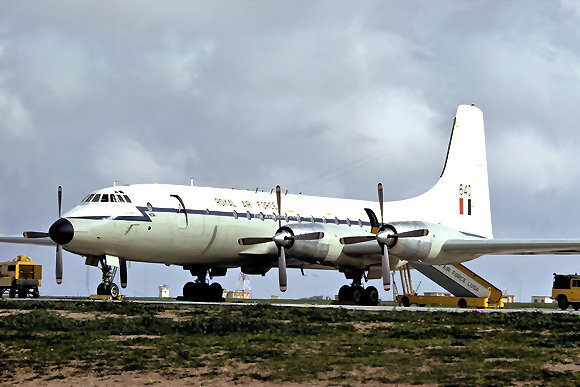 511 Squadron Royal Air Force Transport Command on 30 October 1959. Serialled XL640 and named ‘Antares’, this aircraft, along with all twenty series 253 Britannias, was designated a C.Mk l whilst in RAF service. She operated within the Britannia pool at RAF Lyneham from 16 January 1961. Withdrawn from service she was stored at RAF Kemble from 03 September 1975 with 17359 hours and 7669 landings to her credit. Purchased by Monarch Airlines of Luton on 13 January 1976 and stored at Coventry, she was later ferried to Luton Airport in September 1976 after purchase by Aer Turas fell through. Painted in the markings of Eurafric carrying a Rhino on the tail logo, she was known by the chaps at Airline Engineering as ‘Rhino One’. 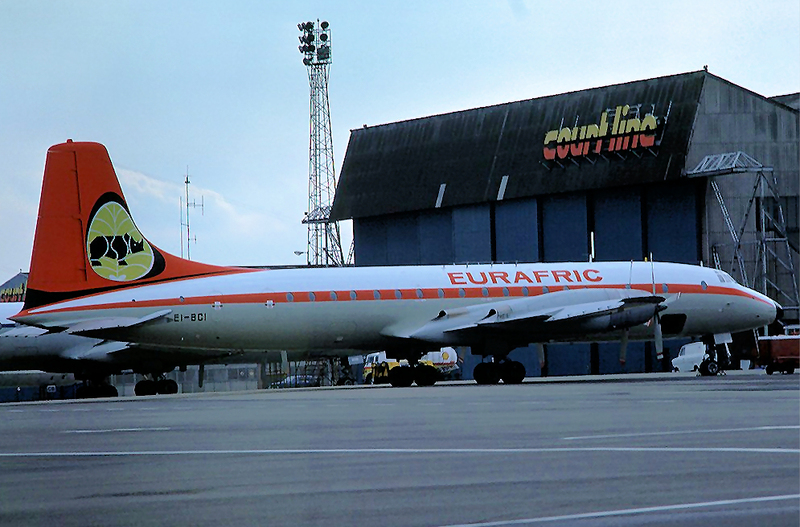 Never operated by Eurafric, she exited the paint-shop on 02 March 1977 and leased as EI-BCI to Aer Turas. She was returned back to Eurafric on 10 April 1978 and then leased again by Aer Turas from 25 May 1978 until 06 September 1978 when she returned once again to Eurafric. After a long spell at Luton Airport, Redcoat Air Cargo leased EI-BCI and she was repainted in their livery and registered G-BHAU, named ‘Amy’. She was accepted by them on 13 August 1979. In service with Redcoat Air Cargo Ltd, G-BHAU’s flying hours had increased to 20 563 and her landings 8469 by the end of March 1981. Purchased by Swordvale Aviation Limited on 02 December 1981 she was flown under the Redcoat operating certificate between Italy and Nigeria carrying cattle. Purchased finally by Katale Aero Transport of Zaire in April 1982 and registered 9Q-CHU she continued to give useful service until withdrawn from use and broken up at Kinshasa in 1986.